Sebastian Vettel has won a highly dramatic 2015 Hungarian Grand Prix that saw the Mercedes drivers involved in collisions and off-track excursions. 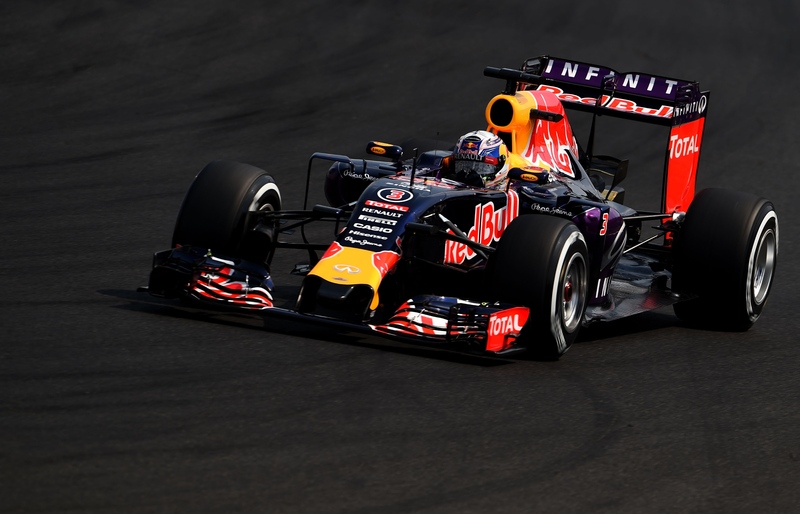 Red Bull capitalized on Mercedes’ calamities to take 2nd and 3rd for Daniil Kvyat and Daniel Ricciardo. Lewis Hamilton and Nico Rosberg would come home 6th and 8th. A minute’s silence preceded the start of the Hungarian Grand Prix, with the 20 drivers joining together with Jules Bianchi’s family at the front of the grid. After this emotional tribute, the drivers put those thoughts to the back of their minds as they strapped in and waited for the lights to go out above them. There was a short delay however as the drivers went for a second formation lap to the grid due to Felipe Massa not stopping correctly in his grid box. When the lights did go out, it was a nigh on a repeat of the Silverstone start. The Mercedes pair didn’t get away well at all. This allowed the Ferrari’s of Sebastian Vettel and Kimi Raikkonen to jump through into the lead by turn 2. The drama didn’t stop there, as Lewis Hamilton appeared to go off track while battling with team-mate Nico Rosberg. This forced Lewis to wade through the gravel trap, which would put him in 10th place when he re-joined the circuit; much to the disapproval of Hamilton who immediately blamed Nico on the radio. On replays however, it looked as though there was never really a gap for Lewis to fill. At the front, Sebastian Vettel was putting in multiple fastest laps to extend a 2 second lead over team-mate Raikkonen by lap 8. Interestingly though, Rosberg in 3rd was no match for the Ferrari’s in the opening stages. He was 5 seconds behind Vettel in the lead, with Hamilton already a pit-stop behind the leader as he pulled off a brave move around the outside of Felipe Massa for 9th place at turn 1. The move was so tight that the yellow stripe of Hamilton’s soft tyres was completely scrubbed off by the Williams. The first pit-stops occurred on lap 14 of 69, with Valtteri Bottas pitting with Daniil Kvyat; with the Russian mightily annoyed with the team after they requested that he not hold up team-mate Daniel Ricciardo. In the mean time, Lewis Hamilton was getting by Sergio Perez for 8th and then vaulted by those who pitted before him. This meant that he was running in 5th place prior to his stop. Perez however was busy being assaulted by Pastor Maldonado on the exit of turn 2, with Sergio bunny-hopping into the air briefly before continuing on his way. The pace-setters soon made their stops around lap 20 onward. Hamilton fitted the soft tyres for his second stint, with the team opting to put Rosberg on the slower medium compound. Race-leader Vettel and team-mate Raikkonen both fitted the soft tyres on their stops and maintained their positions at the head of the field. Crucially though, Hamilton was now right on the back of Ricciardo for 4th place. After several agonizing laps, Lewis finally got by Ricciardo at turn 1 on lap 29, with Lewis now setting his sights on his team-mate Nico ahead of him for 3rd. 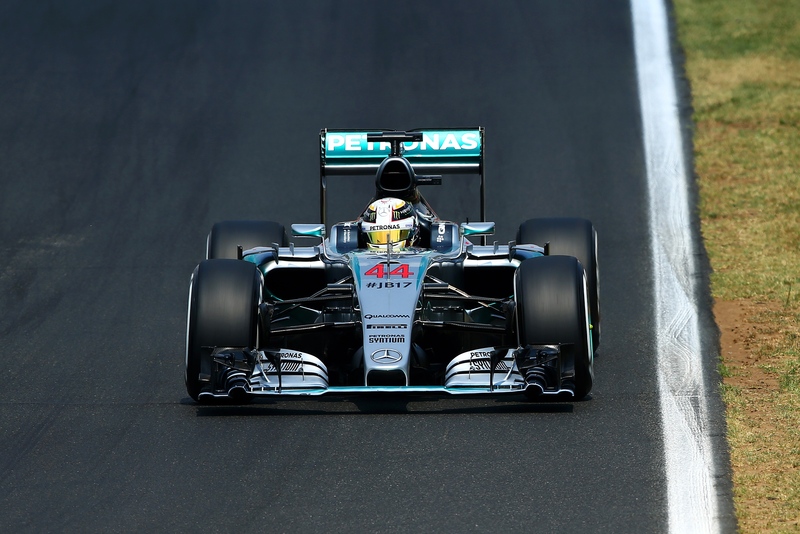 He needed to step on it, as after their final stops, Hamilton would be on the slower tyre compared to his team-mate. At half race distance, Ferrari continued to lead the way with Vettel and Raikkonen 1-2. Lewis Hamilton was continuing to eat into the gap between him and Rosberg, with the gap coming down consistently a second a lap. What was worse for Nico was that he lost almost a second due to lapped traffic in the final sector. Kimi Raikkonen’s day was looking in turmoil as he reported a strange noise at the rear of his car. It was later reported that he had an MGU-K problem that was leaving him down on power. More drama ensued when Nico Hulkenberg’s front wing failed at around 200mph into the braking zone at turn 1. He narrowly avoided collecting the Williams of Valtteri Bottas who was taking turn 1 as normal, but he still hit the wall at a hefty rate of knots. Thankfully he walked away unscathed from his stricken Force India, but the safety car was deployed after a few laps of it’s virtual counterpart; thus decimating the great lead Ferrari had built up. All the front runners pitted under the virtual safety car, with all of the top 4 fitting a set of medium tyres. Interestingly Daniel Ricciardo in 5th was fitted with the much faster soft tyre. 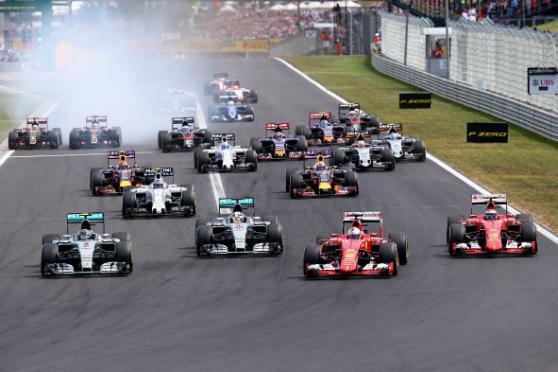 This was all building up to a scintillating final 20 lap sprint to determine the winner of the Hungarian Grand Prix. The Ferrari’s had track position, Raikkonen with a power problem, Hamilton hungry behind his team-mate after their lap 1 altercation and the previous years’ winner lurking in 5th with faster tyres. Game on. Hamilton. It all went wrong for Lewis however as he locked up on the inside and understeered right into the side of Ricciardo; giving himself massive wing damage and forcing him to pit a few laps later for a new nose. What’s more is that the stewards awarded him a drive through penalty which would put him in a highly unlikely position to score any points. If Rosberg finished 2nd to Sebastian Vettel, this would give Nico the championship lead. But Rosberg’s championship lead out of Hungary wasn’t certain, as Daniel Ricciardo was closing in on the leading pair on the soft rubber. If he overtook Rosberg then Hamilton would remain in the title lead. The top 4 drivers remained within 4 seconds, with Daniil Kvyat gaining on the leading trio also with 8 laps remaining. Meanwhile Lewis Hamilton had fought his way by the two Saubers and Jenson Button to get into 8th place; a great recovery after being 20 seconds behind 10th after his drive through and extra stop. The drama wasn’t done yet either, Daniel Ricciardo pulled off an insane out-breaking maneuver to get up the inside. He was well wide however allowing Rosberg to undercut back by, but Nico came across on Ricciardo far too soon and made contact with his front wing. This give Nico a puncture and threw him off of the podium and down into the lower reaches of the top 10 after a pit-stop. This would put him behind Hamilton and would mean that Lewis would end up walking away from Hungary with an extension on his championship lead. Ricciardo was forced to pit again for a front wing which promoted his team-mate Daniil Kvyat up into a fantastic 2nd place. He was awarded a 10 second penalty to be added onto his race time for exceeding track limits earlier in the race, but this wouldn’t change his eventual race position after Ricciardo’s extra stop. 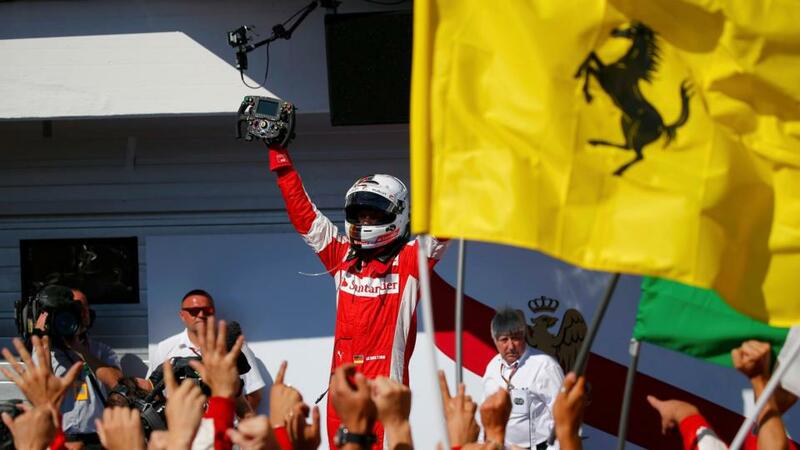 Up at the front, avoiding all the madness, was Sebastian Vettel. He drove a perfect race to take his second win of the season and his second win for Scuderia Ferrari; a win that he would dedicate to Jules Bianchi, who would’ve been a Ferrari driver in his future. “Thank you Jules. You will always be in our hearts. This win is for you,” he said. A fitting tribute to Jules that his future team would win such a fantastic race after such a difficult week. Daniil Kvyat and Daniel Ricciardo took Red Bull’s first podium positions of the year; with Kvyat claiming the first podium of his F1 career. Daniel Ricciardo looked particularly emotional having been a friend and team-mate of Jules in the past. Both he and Kvyat pointed toward the sky upon receiving their trophies. Max Verstappen drove a quiet race to get his best finish of his short career in a fantastic 4th place, with Fernando Alonso getting an unbelievable 5th for McLaren-Honda; a truly awesome finish for the team who have had such a difficult season so far. 6th place would go to Lewis Hamilton, who came back from his late pit-stop and drive through penalty to finish ahead of his team-mate in 8th. Many were surprised that Rosberg wasn’t given a penalty for his contact with Ricciardo as it had happened in a similar fashion to that which had seen Hamilton given a penalty. Finishing between them was Romain Grosjean; who fended off a late race charge by Rosberg to take 7th place. 9th place was Jenson Button who made it a brilliant double points finish for McLaren, with Marcus Ericsson taking the final point in 10th for Sauber. Further back, Pastor Maldonado would finish in 14th for Lotus after getting the most amount of penalties for a single driver in one race for a long time. Surely Lotus have to be thinking that their talented third driver Jolyon Palmer, who has tested for the team in Friday practice multiple times this year, would be a better choice for next year. Kimi Raikkonen was among the four retirees having pulled into the pits in the closing stages with his MGU-K failure. The team had tried to get his car back out, but ultimately the problem was terminal. Nevertheless, the team will celebrate into the night and throughout the summer break before Spa after a fantastic win for Sebastian Vettel and no doubt a glass shall be raised for a man who would’ve very much enjoyed such a cracking race. Ciao Jules.